My name is Kate Smith and this year I have worked as the Charles Hummel Fellow at the Chipstone Foundation. As a historian, I focus on eighteenth-century Britain, and while a Fellow at Chipstone, I have researched such things as the idea of design, female hands and the Chinoiserie style. I have also been working on another project concerned with fossil teapots, asking why these objects were made in eighteenth-century Britain and what they meant to the people who owned and used them. 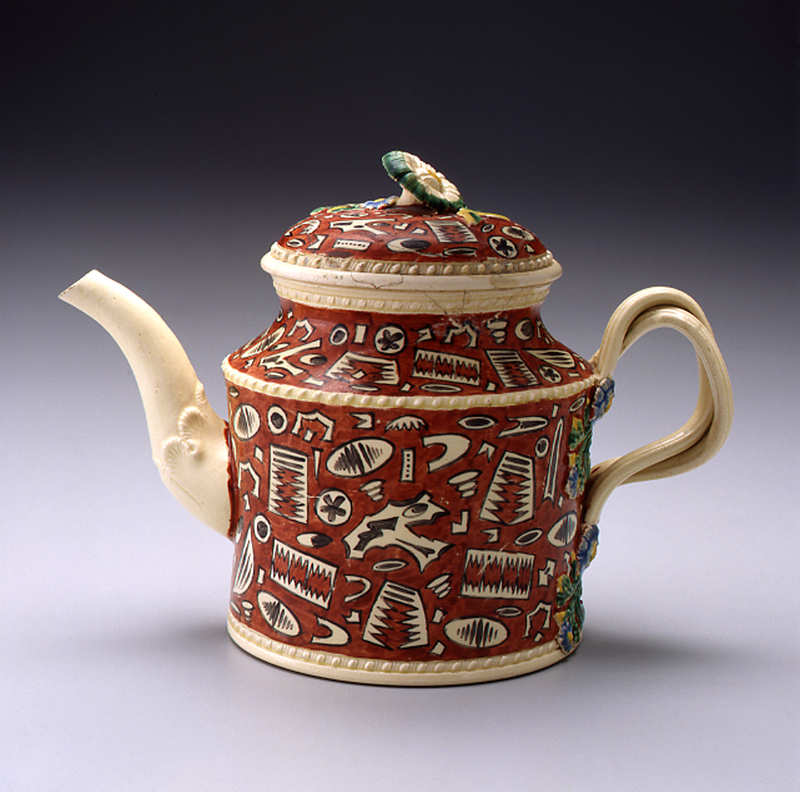 This teapot sits in the Decorative Arts Galleries, which can be found on the lower level of the Milwaukee Art Museum. The form was thrown on a potter’s wheel probably in Staffordshire, England, around 1760. Despite being small, it is visually striking. Look closely and you might see jaws and teeth jumping out at you from the black and white enamel decoration. Potters created this decorative scheme in imitation of a specific type of rock called crinoidal limestone, which was formed in the Carboniferous period around three hundred million years ago. When not in a fossilised form, crinoids are a type of sea animal, which look like flowers moving and swaying on the seabed. This teapot is not the only one of its kind. Another pot, below, with red decoration appears next to it in the Decorative Arts Galleries here at the Milwaukee Art Museum. Other institutions, such as The Metropolitan Museum of Art in New York, also own similar teapots. What I am really interested in is why potters decided to decorate their teapots in imitation of crinoidal limestone in the 1760s. Why this design? Why was it popular? Natural history was a common polite pursuit for middling and elite people living in eighteenth-century Britain. Genteel men and women voraciously collected, noted and studied plants, insects and animals. More particularly, the Philosophical Transactions of the Royal Society tells us that John Ellis, a prominent naturalist, published articles about crinoids in the early 1760s. Clearly, these animals and their fossil remains were of interest to eighteenth-century people. Were these teapots popular because they displayed their owner’s interest in natural history? Did other people recognize the decoration as crinoidal limestone? Let’s consider where these objects would have been used and who would have seen them. In eighteenth-century Britain the teapot was a fashionable object and a key prop in the polite rituals of the tea table. Contemporaries learned to hold these delicate pots and pour them in a particular way. To belong to polite society people had to know not only which objects to buy, but also how to use them correctly. These objects were all about displaying taste and gentility – perhaps they also displayed knowledge? Look again at the teapot. The form – the teapot shape – was an important symbol of politeness and decorum, but what about its decoration? What do you actually see? Do you see teeth, eyes and jaws chaotically arranged together? Or do you recognize it as crinoidal limestone? My research explores the idea that objects like these tested eighteenth-century people. In the eighteenth-century, with the rise of middle classes Britain became a place of social instability. People found lots of different ways to work out who someone was and what social group they belonged to. To be considered polite and genteel, they not only had to know how to use teapots, but they also had to understand what their decoration depicted and why that was significant. It was also testing in other ways too. For instance, think about the strangeness of depicting solid rock on a delicate object made from clay. By exploring the complicated nature of this pot, I want to show how socially difficult objects could be in certain contexts. Objects such as the teapot created a social minefield in the seemingly gentle space of the tea table. 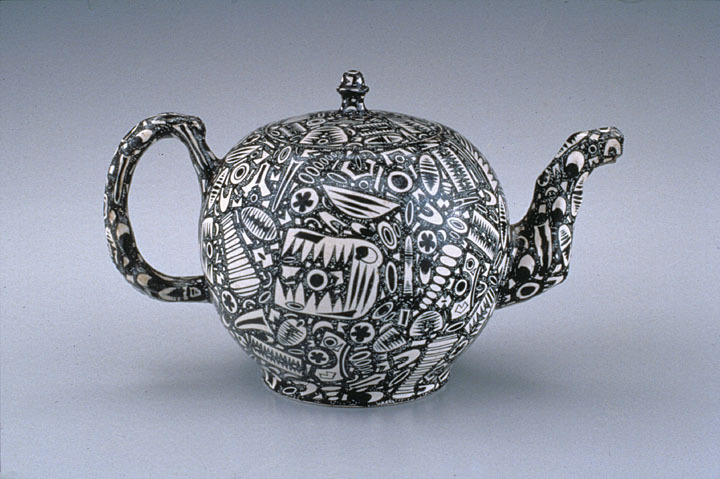 This entry was posted in Art and tagged Britain, Chipstone Foundation, Decorative Arts, Fossil Teapots. Bookmark the permalink.